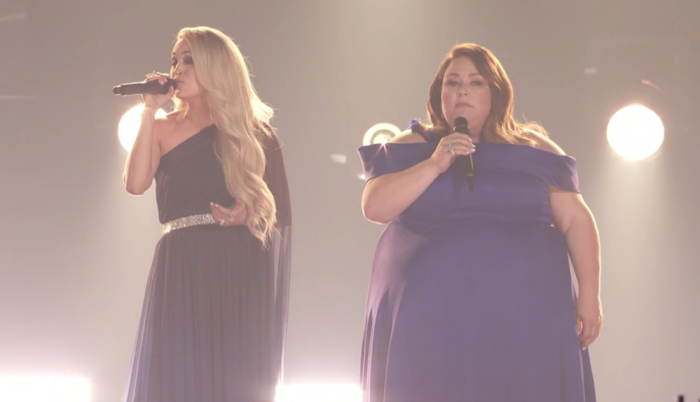 Chrissy Metz, the star of the upcoming faith-based film “Breakthrough,” made her singing debut on live television Sunday at the ACM Awards in Las Vegas. She was joined by country stars Carrie Underwood, Lauren Alaina, Mickey Guyton and Maddie & Tae. The all-star studded ensemble performed “I’m Standing with You” from Metz's upcoming Christian film. The “This is Us” actress was first on stage sporting a stunning blue gown singing the inspiring lyrics. Shortly after, she was accompanied by Underwood and the other singers. “When you're hurting/I want you to know/That you’ll never have to hurt alone/When your faith is, faith is running low/I never lose faith in you/When the nights around you/And you think that no one cares about you/I will go and throw my arms around you,” the song lyrics testify.